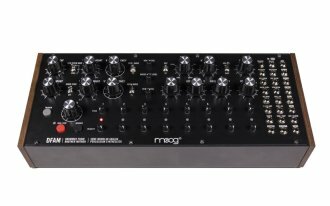 The Moog Drummer From Another Mother (DFAM) is a highly interactive, Semi-Modular Analog Percussion Synthesizer and a vibrant deviation from the traditional drum machine. Handcrafted in Asheville, NC by the employee-owners at the Moog Factory, DFAM is the first addition to the Mother-32 family of synthesizers and presents an expressive hands-on approach to percussive pattern creation. It requires no patching, and absolutely no experience is needed for human-beings of any age to quickly begin synthesizing bold and unique rhythmic compositions. Each DFAM ships with a package of Moog patch cables that unlock access to the 24-point modular patchbay. Use it to create unique sounds or bizarre behaviors, synchronize an unlimited number of DFAM and Mother-32 units together, or fully integrate your analog instrument into a modular Eurorack production environment.